This policy includes key coverages that are important to any business, and also offers additional business-specific options that are important for any apartment owner. A puzzle box (sometimes called a monkey puzzle box) has sliding, shifting, and twisting parts that have to be moved in just the right order before it will open. When I was a little kid my sister had one and asked me to see if I could open it. She watched as I pushed, shifted, and prodded it for what seemed like half a day (probably not more than 10 minutes). Then she took pity and told me what to do to open it. Once she told me, it was simple, but I needed her to guide me through it, step-by-step. Covering Community Banks might seem the same way. Without guidance you could be shifting that puzzle box and never get it. Fortunately for you, Travelers understands the complexities of community banks insurance and will guide you every step of the way until you reach the nice commission inside. Learn more by logging into Big "I" Markets and clicking on Big "I" CBIC Design Pros--an RLI Company from the commercial products menu. Though the statistics are alarming, the risk of injuries and accidents can be minimized. Chubb Recreational Marine Insurance® is pleased to offer a top ten list of tips to help recreational boaters stay safe and reduce the number of preventable accidents that occur each year. There's no mystery to boating safety. Understanding and obeying navigational rules and safety procedures has proven to save lives while reducing injuries and property damage. Having the proper boat and yacht insurance in place will help make boating more stress-free and enjoyable as well. Read on to learn more about Chubb Recreational Marine Insurance® and its industry-leading protection for boats and yachts. July 11. "First Monday LIVE!" is a free monthly webcast hosted by the VU's own Bill Wilson and guests on the first Monday of the month to discuss the wide world of insurance from seemingly non-insurance topics. Each 30-minute webisode covers "what's going on" in the news and the implications. The July broadcast is in development as topic areas are discovered. Click here to learn more and register and here to access the recordings. August 23. "Fixing Commercial Lines Coverage Gaps" Through scores of real-life claims examples and court cases, this program examines common coverage gaps found in many commercial lines policies and addresses the remedies for such gaps in the form of insurance products or risk management techniques CE credit available for attendees in AZ, CT, MI, ND, WA, WY. Click here to learn more and to register. Recently I was in an email "conversation" with Georgia State University professor of Risk Management & Insurance, George H. Zanjani, and the topic of State Guaranty Funds surfaced. It surfaced after his posing the question of whether surplus lines could reach 10% market share in what might become a "new normal" for such placements. This got my attention as surplus lines placements are not generally covered for professional liability allegations if due to the non-admitted insurer's insolvency. 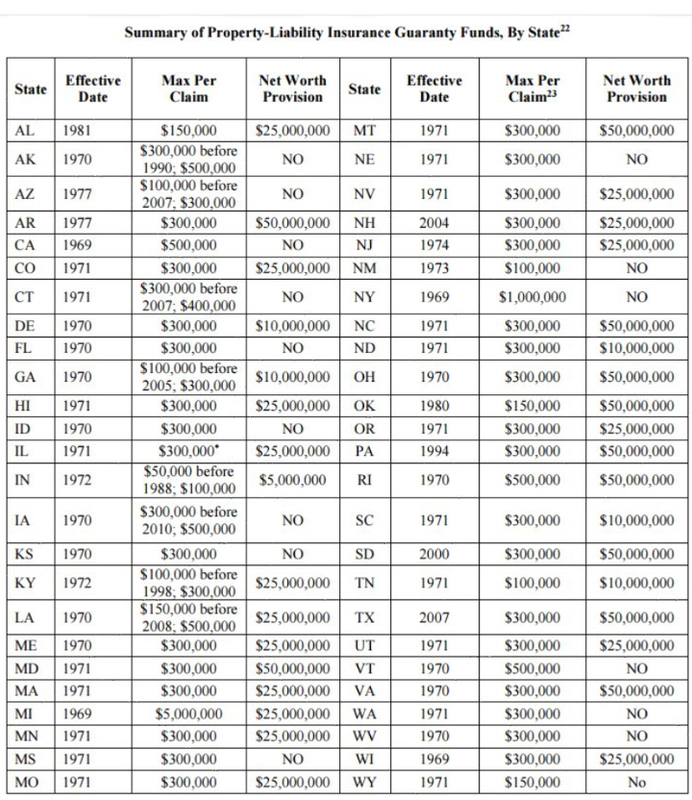 In a related, but separate paper, contributed to by Professor Zanjani there was a very concise summary of state guaranty fund coverage by state. It is reproduced below and an on-line version is available (Go to page 30 of 54 and Table 1). What are some surprises from looking at state guaranty fund laws? 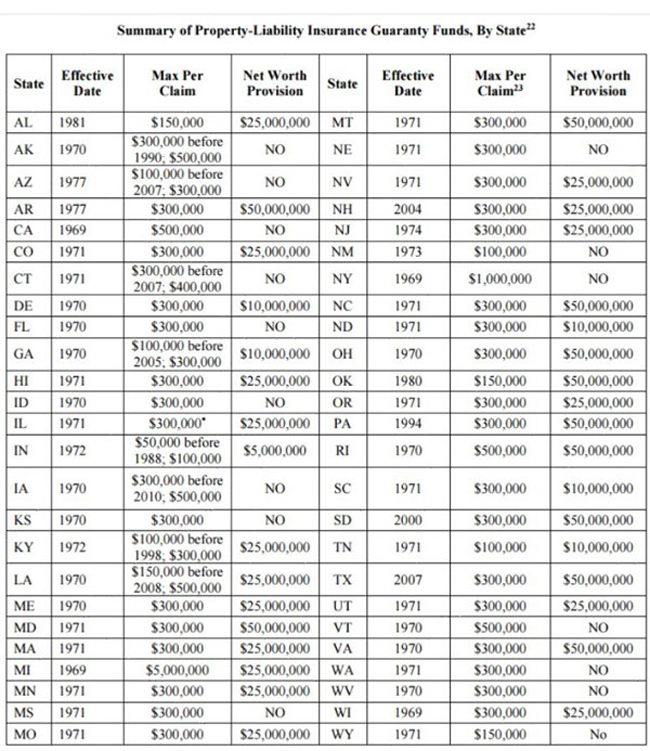 First, there are limits on the insured's "Net Worth" varying from $10,000,000 to $50,000,000 (see below). This appears it can apply to personal lines or commercial insureds and claims that are covered by the guaranty fund can become a liability for both property and liability claims. Second, insureds covered by placements involving the Federal Risk Retention Act may not be covered by the state guaranty fund? Yes, possibly including Risk Purchasing Groups. I was not understanding a reference on the Insurance Information Institute's website to Risk Purchasing Groups but after looking at a few state guaranty fund statutes, exclusion of RPGs certainly may be the case in some states. 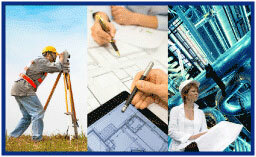 Do you want to research your state Guaranty Fund? You can probably find a link to it at the National Conference of Insurance Guaranty Funds (NCIGF) at www.ncifg.org under Resources and Guaranty Fund Web Sites". Source: Deng, Y., Leverty T.J., and Zanjani, G. Market Discipline and Government Guarantees: Evidence from the Insurance Industry. Page 30. Congratulations to our agent in Louisiana on a performance bond sale of $12,365 in premium!